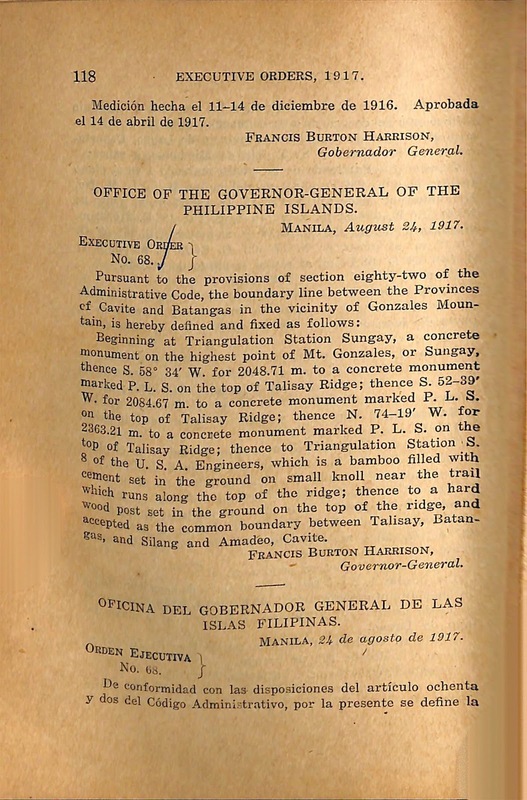 On 24 August 1917, the Office of the Governor General Francis Burton Harrison defined the boundary line between the two provinces of Batangas and Cavite. The executive order1 issued by the office made mention of landmarks which in most probability would not be physically recognizable in the present day. Beginning at Triangulation Station Sungay, a concrete monument on the highest point of Mt. 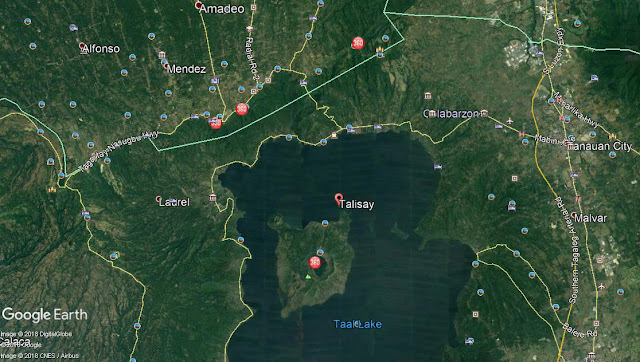 Gonzales, or Sungay, thence S. 58° 34° W. for 2048.71 m. to a concrete monument marked P. L. S. on the top of Talisay Ridge; thence N. 74-10° W. for 2363.21 m. to a concrete monument marked P. L. S. on the top of Talisay Ridge; thence to triangulation station S. 8 of the U.S.A. Engineers, which is a bamboo filled with cement set in the ground on small knoll near the trail which runs along the top of the ridge; thence to a hard wood post set in the ground on top of the ridge, and accepted as the common boundary between Talisay, Batangas, and Silang and Amadeo, Cavite. 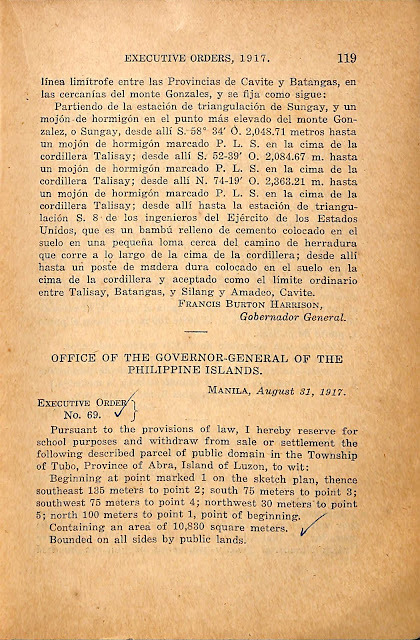 English version of Executive Order 68 series of 1917. 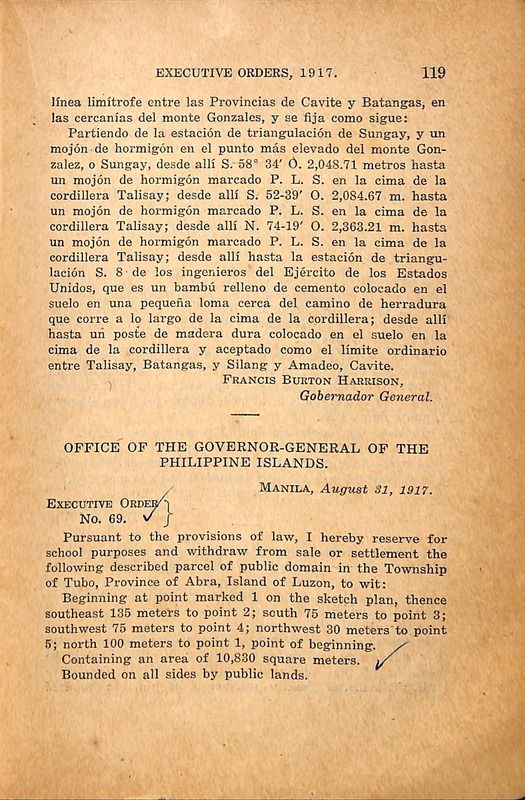 Spanish version of Executive Order No. 68 series of 1917. 1 “Executive Order Nos. 1-113 (1917),” online at the Internet Archive.